AngularJS has almost become indispensable in the front end development of web applications. It is one of the best technologies for building data driven, CRUD single page applications. A developer need not use any other framework for front end web development. It has achieved widespread popularity among developers due to some of the conducive features it hosts like declarative programming, modular and highly scalable code. 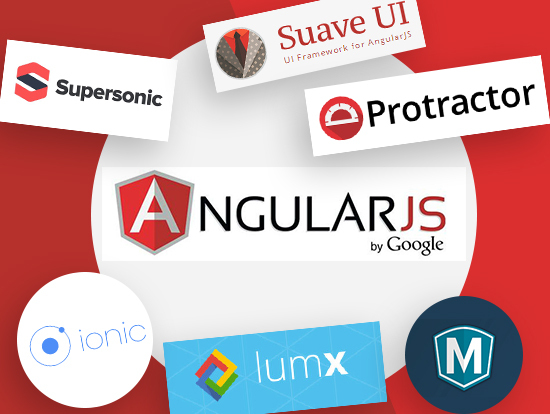 One can realize the full potential of AngularJS through a good framework. That being said let’s get down to know some of the most commonly used frameworks for AngularJS. It contains the complete library of optimized HTML, CSS and JS as it is built upon AngularJS and SASS. AngularJS for web application that is forged through Ionic can be uploaded to both app and play store. Every component of this framework is enhanced especially for mobile experience which is centered on touch and gestures. It is very useful in building responsive apps at a low cost. It is based on the Google material design. Developers can build user interfaces as per Google’s guidelines. It is one of the best frameworks for building web based app. It is also good for customized apps. Your files can automatically be optimized and your app functionality can be improved significantly using this framework. SUPERSONIC UI is the first Hybrid App UI Framework. Supersonic UI used to build data-driven hybrid mobile applications with real native performance and highly interactive interface. Backend data interaction is simple, as it’s easy to integrate with multiple native APIs. If you intend to develop API powered applications for iOS and Android then you should thinks of using supersonic framework. Suave UI framework is especially good for web application development with AngularJS. For the purpose of building a variety of web based UIs, AngularJS and Suave UI has CSS definitions, directives and services which is capable for the job. Font Awesome and Animate.CSS provide icons and CSS animations respectively and are included in bundle files. Hence they needn’t be used separately in the project. This framework is the best way to work on a grid or table with Angular. Its rich features help in displaying simple, complex and large data sets on grid. They make use of the plug-in architecture of the Angular framework that only uses features required by the project. There are number of customizable templates to select from and a user can personalize them by simply making changes to it. There are a host of functions which can be done through this framework like sorting, filtering, grouping, virtualization and column pinning etc. Mobile Angular UI framework built for mobile UI development needs and it works like Sencha Touch or jQuery Mobile. If you know Angular JS and Twitter Bootstrap already then using Mobile Angular UI framework for mobile application development will be very easy. It is an extension of the Bootstrap framework which includes specific mobile components like switches, overlays, sidebars and scrollable areas. One can very well convert their desktop web application into mobile version by adding a CSS file in Mobile Angular UI framework to make responsive and touch enabled. It comprises of constituent technologies like MongoDB, expressJS, AngularJS and NodeJS which forms a full stack. The framework has the potential to build powerful web applications as it has pages with dynamic functions. It is regarded as an efficient NodeJS end-to-end testing framework for Angular and AngularJS applications built on top of WebDriverJS. For the purpose of interacting with the application this framework uses native events and browser specific drivers. It has Angular specific locator strategies which enables one to test Angular specific elements without any setup. The user needn’t worry about syncing the test and webpage as protractor automatically executes the subsequent step in the test when the webpage finishes pending tasks. It is an HTML5 video player for AngularJS. It has not support for flash which makes the code easy to maintain. There is no need of JSON objects and config files as one can write plain CSS for creating their own theme. It is a framework popular for building video apps and hence there is support for having multiple media files inside a video player and has the ability to manipulate all of them. It has a number of directives that are based on the Foundation markup and CSS elements. One of the upsides of developing in this framework includes highly semantic HTML components. Building a web app from scratch with AngularJS. There have been continual developments in the AngularJS framework. Currently there are talks about version 6 of the AngularJS. Parallely there has been improvements in the frameworks that house AngularJS code and let the developers achieve what they want. Ionic may be the most common framework but there are other frameworks which are specifically designed for a certain purpose. Each framework has its own functionalities, features and UI components and it is prudent to choose that framework which best suits your requirements. Get in touch with us with your requirements and we’ll get back to your as soon as possible. How AR/VR Will Change Your Shopping Experience In 2019?